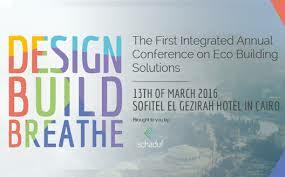 A sustainable architecture conference with speakers from around the world is taking place at Sofitel El Gezirah Hotel in Cairo on Sunday 13 March. Design, Build, Breathe aims to showcase the latest eco solutions and create a dialogue between government officials, architects, real estate developers, technology providers and academics in this field. The conference is the first annual integrated conference of its kind and will include interactive talks, panel discussions and workshops exploring all that is possible in the world of sustainable innovation highlighting green building, urban planning, and energy efficiency. 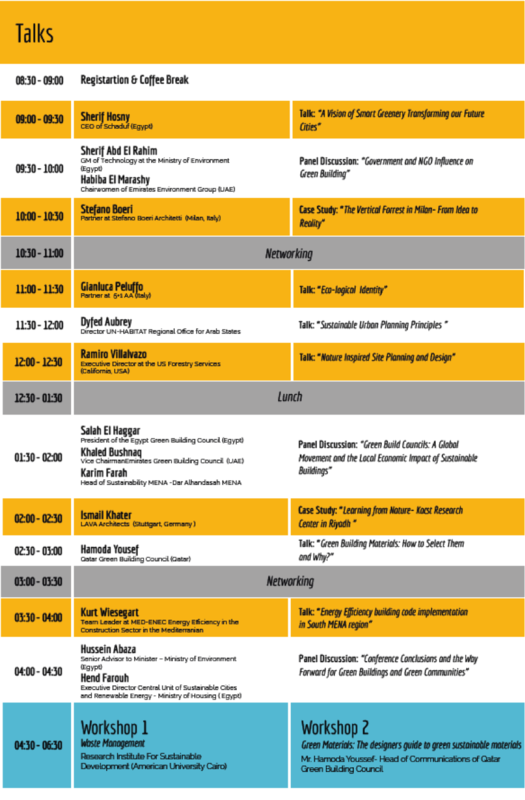 Workshop 1: Waste management – Research Institute For Sustainable Development (American University Cairo). Stefano Boeri is professor of urban design at the Politecnico di Milano and formerly editor in chief of the international magazines “Abitare” and “Domus”. Between 2011 and 2013 he was executive councillor for culture, design and fashion for Milan Municipality. Ismail Khater, an architect specialising in building optimization into resource efficiency and sustainability, currently working at LAVA in Stuttgart. Sherif Hosny, CEO of Schaduf for green architecture and designs and formerly managing director of Rio Tinto Alcan International Network in the Middle East and North Africa. Ramiro Villalvazo is president of RVD Consulting, with 35 years experience with the USDA Forest Service and as the Pacific Southwest Director for Public Services. Dr. Salah El-Haggar is president of the Egypt Green Building Council. He is also professor of energy and sustainable development and chair of the mechanical engineering department at the American University in Cairo. Habiba Al Marashi is co-founder and chair of Emirates Environmental Group. She played a key role in the growth of the EEG, an active multi-sectoral organization that has successfully brought the government, private sector and community under the same banner. Khaled Bushnaq is vice chair of the Emirates Green Building Council and CEO of EMS, a leading energy management company working on big scale projects with International Alliances in Energy Audits and Performance Contracting projects in the region. Dyfed Aubrey is UN Habitat Regional Director for Arab States. He is a UK trained architect and urban designer and worked with international NGOs in Kosovo and Sri Lanka as a reconstruction manager, supervising post-conflict/ post-tsunami housing and schools reconstruction. Karim Farah is a senior architect/sustainability manager/LEED specialist. He is LEED coordinator for more than 20 active projects seeking Certified, Silver and Gold levels in Riyadh, Jeddah, Dubai, Abu Dhabi, Bahrain and Cairo. Gianluca Peluffo is a founder and partner in 5+1 AA architecture firm in Italy and a researcher at the Faculty of Arts, Tourism and Markets at IULM University of Milan.